Mesotherapy VS Dermapen skin needling: What’s the difference? Both Mesotherapy and Dermapen skin needling are in-office treatments involving tiny little needles but they’re not the same thing. While mesotherapy injects, micro-needling merely makes little wounds. But, both therapies can be extremely effective in treating several skin conditions. To help explain the difference, let’s break it down, shall we? Pioneered by a French physician in the 50s, Mesotherapy involves using a cluster of short, thin needles to inject a mix of active ingredients. These go directly into the middle layer of your epidermis improving effectivity. What’s injected will rely on what’s being treated. For example, if you’re wanting to get rid of fat in a particular area, you’ll use a lipotropic (something that acts as a catalyst to break down fat). Should you wish to rejuvenate your skin in general, we’ll use our special elixir. This solution includes growth factors, peptides, vitamins, hyaluronic acid and more. As a topical anaesthetic is applied beforehand, the treatment is painless and shouldn’t take longer than an hour, often less. You will require a number of treatments for best results, usually 4 to 8. The downtime depends on what condition you’re treating and the intensity. For general rejuvenation, there’s actually no downtime at all. You can go straight back to work and will experience only a little temporary dryness or a feeling of ‘tightness’ by day two. If you’re reducing fat, you’ll probably experience mild redness and swelling. It resolves within three days, and bruising may be visible if your treatment was a very intensive one. Fatty area treatment requires a little downtime. At Skin Renewal, Dermapen skin needling has been safely performed – and with great success – for years. Like mesotherapy, it means using thin needles that can be adjusted in length to penetrate your skin. But please note that these don’t inject any type of active. Their purpose is solely to make a myriad of tiny ‘wounds’ that stimulate the skin to ‘heal’ via producing more collagen. This makes it very useful for general skin rejuvenation as well as to target wrinkles, enlarged pores and acne scarring. While we still offer skin needling using a roller, Dermapen skin needling is superior. The needles are injected straight down instead of at a rolling angle, more wounds are created per square centimetre and it’s easier to reach trickier areas like around the nose and eyes. Much like mesotherapy, the procedure is painless thanks to the application of a topical anaesthetic. Once again, you’ll be in and out of the treatment rooms within an hour. For best results, you’d require a series of treatments, about 6 to 12, but this would depend on the severity of your skin’s condition. As far as downtime goes, this is minimal because, as the wounds are so tiny, your epidermis will heal in a matter of hours. Appearance-wise, it will look like you’ve got a mild sunburn, but this will improve within 24 to 48 hours. Luckily you can wear a treatment foundation like Lycogel directly after the procedure, as well as, a normal one the very next day. A few days following the procedure you might feel dry and tight, but this phase is very short-lived and barely noticeable. You may look sunburned after the procedure, but this look is fleeting. While both mesotherapy and skin needling involves tiny needles and both can do a good job of skin rejuvenation. The former can also reduce fat and the latter is a more effective choice if you’re wanting to target wrinkles and acne scarring. As far as pigmentation goes, both Mesotherapy and Dermapen are helpful. However, Mesotherapy might be a better pick for stubborn spots as you can target it with skin lightening ingredients. If you’re still confused as to which would suit you best, simply make an appointment to see one of the doctors or therapists at Skin Renewal. They can easily recommend the best treatment solution to help you create the healthiest and best-looking version of your skin. 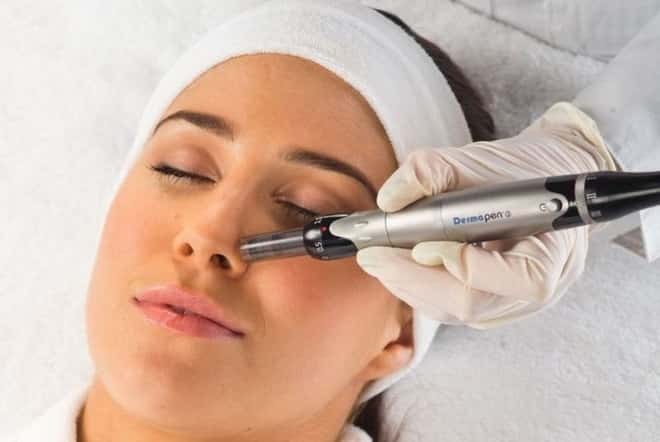 What is the cost of mesotherapy and demapan?